The Last Baby – Will I ever be ‘done’ having children? My son is one week old. I am sat here feeling tears forming in my eyes as I struggle to recall EXACTLY what it felt like to feel him move inside me. How can it be that I can so quickly forget something that I felt every day for four months? I remember the little jabbing movements of the second trimester, and then the big rolling waves of the late third trimester. But I can’t put myself back there entirely. It already feels like a faded memory. He was meant to be our last. Three was always the plan. I’d have more in a heartbeat but for many reasons, three suits us, three works. I don’t know if I can give enough of myself to four children, and Sam, as he has told me many times, is most definitely done at three. I don’t think I’ll ever be one of those people that just knows when they are done. I don’t think I’ll ever be ‘done’, underlined with a full stop at the end. But, at some point, you have to stop. And yet I stumble over saying “third and final”, I can’t bring myself to state that he is categorically our last. Our final. I can’t imagine never doing this again. I absolutely do not want to accept that I am never doing this again. I’m wobbling every time I think of something we’ll never do again. No more midwives, no more green book, purple book and red book. Am I to never again walk out of the antenatal department clutching a grainy black and white scan picture? Will I never again have a new person to meet? Experience that new baby euphoria? Will all the future newborn babies that I will hold from this point belong to other people? When he grows out of his clothes, is that it? No reason to store them away in the loft, no new sibling to hand them down to? Just the very last time that item of clothing will be worn by one of my own? When I read this back in a years time, swamped with children and racked with sleep deprivation, will I think I was out of my mind for even considering that three wasn’t enough? Will I be looking forward to the next chapter of our lives with a weary sense of relief? Will I be comfortable with the sense of finality that feels overwhelming right now? I don’t know how it’s going to pan out. But right now, I’m feeling every milestone like a ton of emotion-laden bricks. Right now, I am not ready for this to be the last time ever. The image above was taken by Roma Rose Photography – Leanne’s newborn posing skills are seriously impressive, and I love her clean, natural aesthetic – not one novelty prop to be found! I don’t have any nice photos of myself with either of my older boys when they were this tiny, and I’m very glad I finally forced myself to be on the other side of the camera this time round. With three children and a camera never far away, Chloe Bridge is the author of family lifestyle and travel blog, Sorry About The Mess. 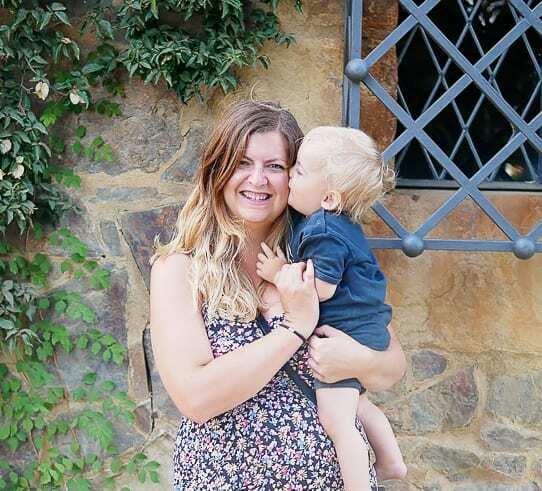 Chloe writes and creates video about her experiences of motherhood and life with young children. Why can’t I remember the toddler days? I think this feeling fades but never goes away. My number 3 is 18 months old and I know he is the last. That doesn’t make it any less bittersweet but I know I would not be able to give as much with another child in the mix. I try to look forward to all the exciting things ahead and get my baby fix from friends and family. I think you’ll find peace with this in a little time. The photograph of you both is exquisite. I think you are right, the emotions are heightened at the moment because all the last times feel so fresh in my mind, but I cna see a point in the future where I am at peace with it all. I knew when I had E (my second child) that I was ‘done’ but I still get emotional about every ‘last’ time. I sat and sobbed when my youngest was a week old because he’s our “last” I did the same when my milk dried because he wouldn’t breastfeed and neither would my eldest. I knew I had lost my chance to try and breastfeed. I have always wished for 3 and even tho I’m so enternally grateful I was blessed with 2 Beautiful stubborn children, sometimes despise that my husband doesn’t want anymore (he’s got 3 grown up ones as well). I’d like to say I’ll come to terms with it – but I’m not sure I’ll ever loose the feeling of that one last baby.